See here for latest news on System Simulation's work at the V&A! We have supplied a series of systems to the Victoria and Albert Museum over a number of years, including its core collections management system and an integrated image library, which has allowed the V&A to catalogue its collections of photographs, while also linking images to physical objects. These systems in turn have allowed the V&A to provide an on-line access system to its general collections. In a recent series of projects, however, we have been assisting the V&A to achieve much greater integration between its various IT systems, ranging from collections management and asset management to front-of-house and commercial systems. We implemented the V&A's Collections Information System (CIS) using the MUSIMS package built on Index+. This is a comprehensive and large scale system providing full control of acquisitions, inventory, catalogues (objects and parts of objects) and groups (of objects) for all departments of the V&A. CIS stores and retrieves both text and images through powerful and comprehensive search forms. The interface enables the creation and editing of all records including location changes and transfers, with full security and audit trails. It follows the Museum Documentation Association's Spectrum data standard closely. A full range of terminology control is provided including local term lists, name authorities and the Getty Institute's hierarchical Art and Architecture Thesaurus. We supplied the early Index+ Image Library to the V&A to catalogue its collections of photographs. Working closely with the V&A we integrated the Picture Library (V&A Pic Lib) and Collections Information System (CIS) supplied by us. A key objective, now complete, was the preparation of an online access infrastructure with an initial total of 10,000 images with appropriate search and retrieval facilities to enable the V&A to provide access to images via its website. The infrastructure allows for new images and new content to be added at any time. Newly created catalogue records and images, once registered in the CIS/Pic Lib system and stored in the 'Image Arena', are approved and submitted to the online 'Search the Collections' website without the need for further technical manipulation or processing. 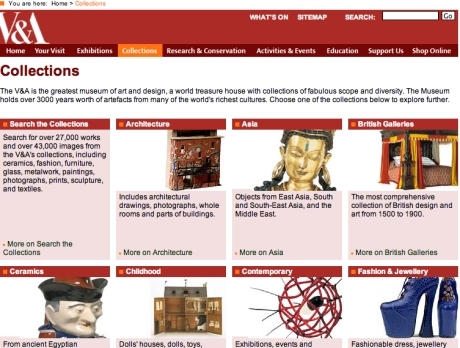 Visitors may search the Collections Online section of the V&A website for over 30,000 works from the V&A collections. The website covers a wide range of objects, including ceramics, fashion, furniture, glass, metalwork, paintings, photographs, prints, sculpture, and textiles. Many have been selected from recent publications but less well known items and objects that cannot be permanently on display have also been included. The database will grow rapidly. It has become an important reference, and an educational and research resource. Many of the works of art included here have been in the collections for decades; however, ongoing research continues to add to our knowledge about them and this site will grow and change. As scholarship advances records will be continually enhanced. In a recent series of projects we have been assisting the V&A to achieve much greater integration between its various IT systems, ranging from collections management and asset management to front-of-house and commercial systems. In particular, we are currently implementing a Digital Asset Management system that will centrally manage the Museum's digital assets, feeding them, as required, into a range of more specialist applications. AssetIndex+ is a more general version of ImageIndex+ providing for the management of video and audio and a series of other assets, such as text files, publications and even PowerPoint presentations. At its heart, however, is the management of still images that makes use of many of the core features of Imageindex+. The new Digital Asset Management system at the V&A will supersede the previous picture library system. In doing so, it will introduce many of the new features that make ImageIndex+ a highly efficient working environment, but it will also bring in new technology, for instance, in the use of WSRP embedding techniques to deliver images as 'portlets' to a series of other applications, such as the library catalogue and the commercial systems.